As the year winds down, it's time to look at the goals I set for 2018 and think about plans for 2019. 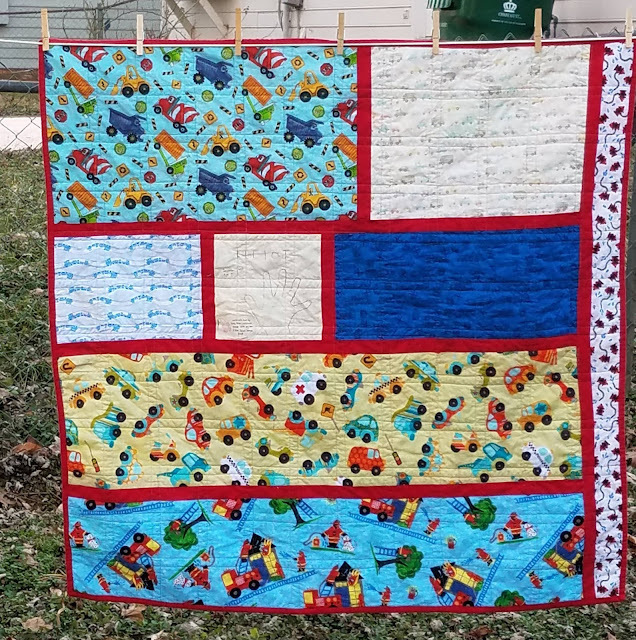 Yvonne of Quilting Jet Girl inspires others to set goals through her 2019 Planning Linky Party. First, let's look at my goals and see how I did. I kept up with both my online bees and was a part of the Modern Plus Signs Blog Hop to promote the fantastic book by Cheryl of Meadow Mist Designs and Paige of Quilted Blooms. I had five bed-size quits on my list this year. The smallest of those (twin size) is about one hour of television from being done. The others, not done. But I'm optimistic that I will finish at least two of the remaining "Big Five" in 2019. Reality is that I just don't enjoy making large quilts, especially layering and quilting them. I did this faithfully for the first six or seven months of the year, then I got behind. I wouldn't blog a finish until I calculated the yardage used. This meant I got behind and gave me a chore. I decided the calculations were taking up precious sewing time and stopped tracking. I know that I used way more than I bought, though. I did pretty well at not buying much this year. I tried the Quilter's Planner in 2017 and it didn't work for me. I bought a pretty blank book for 2018 and turned it into a tracking notebook. It worked well for about six months, twice as long as I lasted with the planner. It turns out that the blog and a simple Word document are all I really need to keep track of finished projects, so I'm calling this successful since I figured out what works for me. That phrase is in quotes because it comes directly from Diana at Red Delicious Life. This was my second year using this goal and I think I did fairly well. I did several Quilt Alongs but I kept up with (or at least eventually finished) them all. And there were some I planned to do that I decided either the timing was off or I didn't love the design so I skipped them. I'm calling this a success. Tish's Fireburst QAL was my favorite this year. This is always one step forward, two steps back for me. 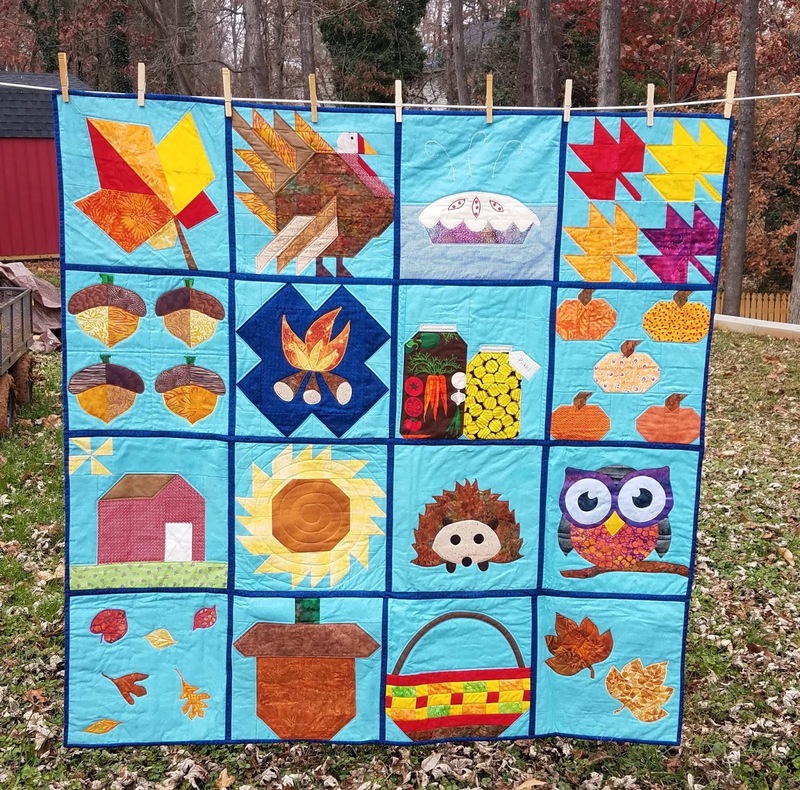 I blasted through this goal with 16 quilts donated to my local Project Linus Chapter and a quilt to go to those impacted by Hurricane Florence. And a Personal Goal: Learn SpanishI took two semester-long classes at the community college where I work. It's a good start, but I have a long way to go. Taking the classes cut way into my sewing time. I'm glad I did it, but I'll be taking a break for at least the first half of 2019 due to some family commitments in the beginning of the year. I'm in just one bee this year, Stash Bee, and I'm a Hive Mama. My other bee is moving to a different format where we can choose what to be involved in. 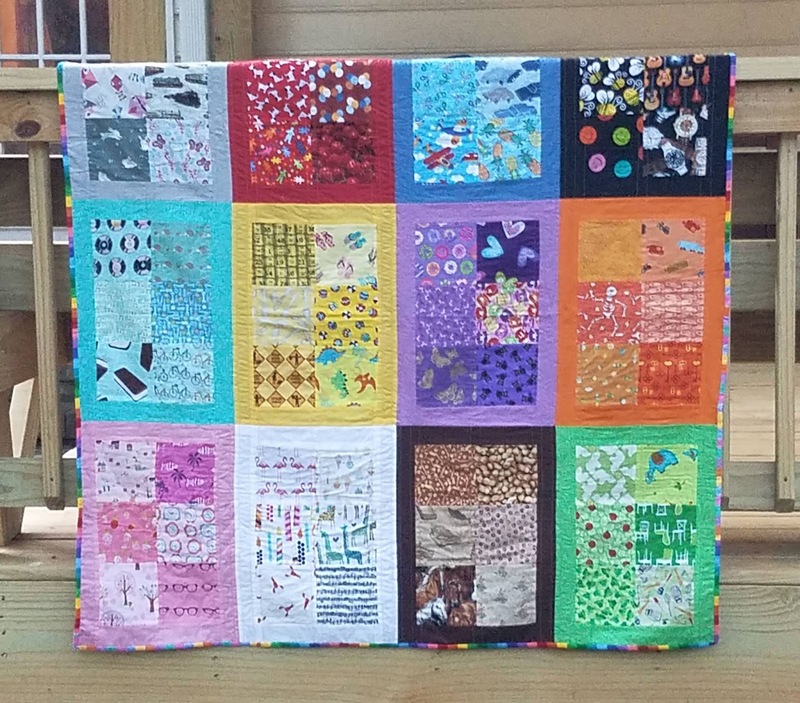 I'll be working on charity blocks with that group, as hostess in January and then I'll make blocks for the other two quilts throughout the year. This is one area where I did really well in 2018. Thanks to the PhD (Projects Half Done) Challenge with Gail of Quilting Gail (full update on my PhD coming soon!) I completed a lot of projects that were started prior to 2018 and *all* projects started in 2018. It did feel limiting sometimes to not be able to start new projects, which is where the balance comes in. I don't have a super concrete idea of what this looks like, but to quantify I'm thinking completing at least 7 of the 10 projects started prior to 2018 that are not yet completed. I also have a loooong list of possible projects for 2019 (from fabric I already own), so maybe not more than 6 that are started by not yet complete? Those are good to shoot for. This one is hard, but I have so much fabric. And, as mentioned above, a looooong list of projects/potential projects with fabric I already have. I really, really want to focus on using what I have. I was given two Christmas gift certificates; my plan is to buy any fabric needed for QALs with those certificates or use what I already have. Beyond that, perhaps an occasional background fabric to use with fabrics I already own. My annual goal has been 12 quilts for my local Project Linus chapter. I knocked that out of the park this year with 16. I'd like to donate 25 quilts in 2019. A minimum of 12 will be to Project Linus, others may go to things like Hurricane Florence or other needs that I can help meet. I think this is one I haven't written down before. I get so much out of the online community, I don't want to forget that those online connections matter to me. This could take many forms, and really I'm looking to continue what I've been doing. I've participated in the Finish Along since I discovered it in 2015 and I like to visit projects that catch my eye and comment. I love Quilt Alongs and I have my eye on a few for 2019. I like chatting with the quilters whose bogs I read regularly and with those who comment here. And so that's my look back at 2018 and my look ahead to 2019. Happy New Year! I like to keep a hand sewing project around for trips or other times when I'm not able to use the sewing machine. I'm always on the look out for projects and I pick things that don't have a timeline, as my goal is to have something to work on, not to finish it as soon as possible. But of course eventually I finish the hand work and then it becomes a UFO. I've had the stitching done on this for a few months but was stumped as to how to finish it. Then I found inspiration in the form of rick rack and it's done now! 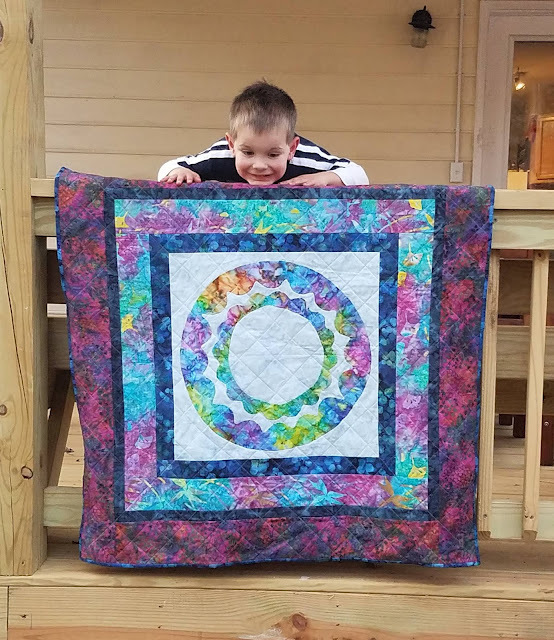 The pattern is Vintage Holiday by Tina Lewis and was in the December 2014 issue of American Patchwork & Quilting. As soon as I saw it, I knew I had to make it. It looks like my childhood. Our side street had a great hill and when it snowed, everyone from the neighborhood would gather at that street and sled down. (This was in Virginia; side streets were not plowed). One year, there was construction nearby and one of the parents ...borrowed a road barrier and put it at the top of the hill so cars couldn't come down. Anyway, these happy sledders remind me of sledding with everyone in the neighborhood. Pretty, but missing something. I also wasn't sure how to bind it, because as you may be able to tell, this is felt. So I decided to just add a backing of another piece of white felt. I zigzag stitched the two together and then I added the rick rack. I'm pretty sure this was my first time using rick rack! I love how it looks, and it kinda adds to the vintage vibe. I changed up the design a little. The original was a pillow and it had words on it. I didn't want the text because I wanted it to be winter and not necessarily Christmas, so I removed the words and added another sled. 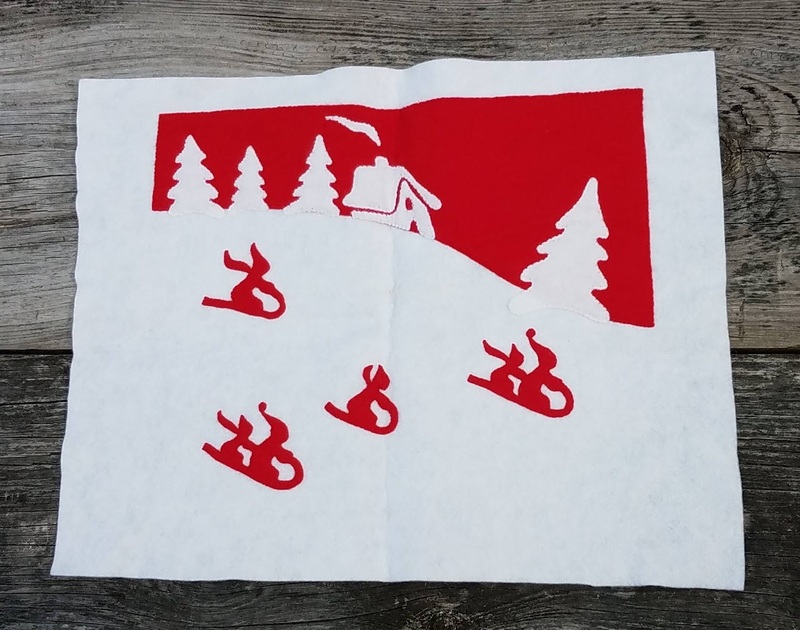 There was also originally snow on the red background. When I got to that part, I decided 1) that I didn't need the snow and 2) that I really didn't want to applique teeny tiny circles. I'm actually really happy with it without the falling snow. But I had already cut out all those teeny tiny circles. Anyone need a baggie of tiny felt circles? There are three different sizes. They have freezer paper on one side. 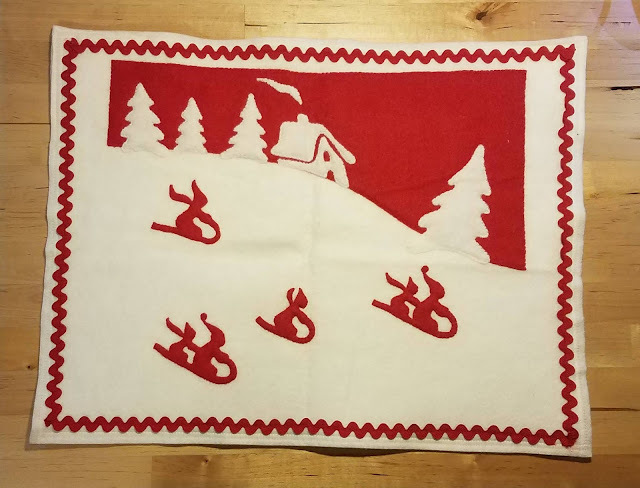 Winter Memories (originally called Vintage Holiday, since that is the name of the pattern) was #12 on my list of Q4 goals for the globally-hosted Finish Along. It was also on my list of UFOs to finish to earn my PhD (Projects Half Done) with Quilting Gail. Occasionally, my son (age 5) will get interested in sewing with me. 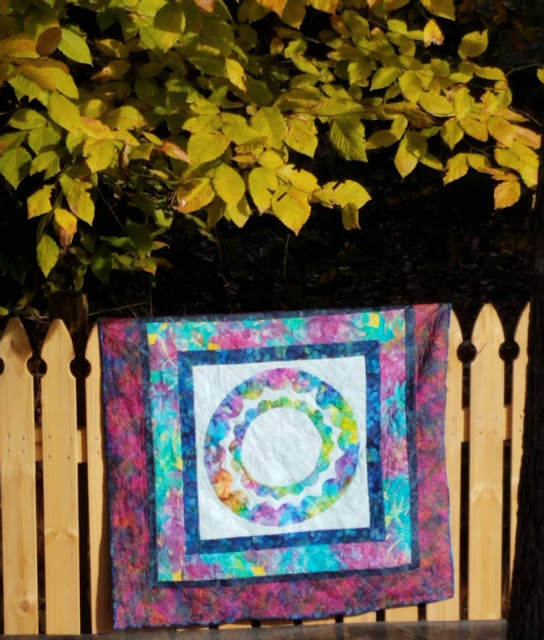 This summer, I did an I Spy swap hosted by Val of Val's Quilting Studio. I let Fire Monkey (my son) pick out his favorites and whenever he was in the mood to sew with me, we'd get them out and put them together into rows. Mostly he'd sit on my lap and help move the fabric but sometimes he'd get on the floor and watch my foot work the pedal. I'm pleased to say that I finished it on Christmas Eve day! We've had the top done for a while but I knew I had to piece a back and that held me up a bit. I did most of the quilting alone but did save a few rows for him to help me with. It's straight line quilting just inside each of the seams. I did the back on my own but all fabrics were pre-approved by the Fire Monkey. The sashing and binding are Kona Cardinal. I used red because that's his favorite color, and it's his favorite color because red is the color of fire trucks. You may have noticed that there is a hand in the middle of the back. I traced his hand and had him write his name, then I dated it and added my own label. I like that it's in the middle and easily visible. In addition to being a great way to record the history, he's still in daycare until school starts in August and I'm sure this will go with him frequently, so it's good to know it's clearly labeled. The day we made the label happened to be my birthday, so that's a nice touch, too. In addition to choosing all the fabrics, Fire Monkey told me which ones went together. 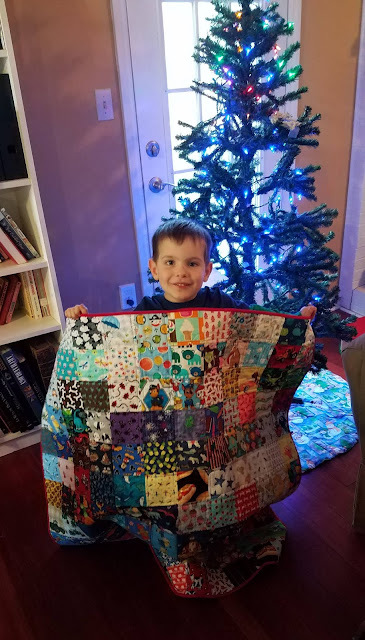 There are duplicate fabrics and like things next to each other, both things I avoid in my I Spy quilts, but this one wasn't for me, so I really let him be in charge. "Quilt for Fire Monkey" was #8 on my list of Q4 goals for the globally-hosted Finish Along. Upper right. Note that this is where most of the fire fighter related squares are. With this finish, I have officially earned my PhD (Projects Half Done) with Gail of Quilting Gail. There were two parts to Gail's challenge. The first was to make a list of all your UFOs at the beginning of the year and finish at least half. I had 29 on my list and have currently finished 17, with the possibility of one or two more before the end of the year. This was the easier half of the challenge for me. Lower left. The pandas doing yoga are my favorites. The second half of the challenge is that you must complete all project started in 2018. Well, between 2018 Mystery Quilts and Quilt Alongs and babies that I didn't know about in January plus a few other distractions, I started several. 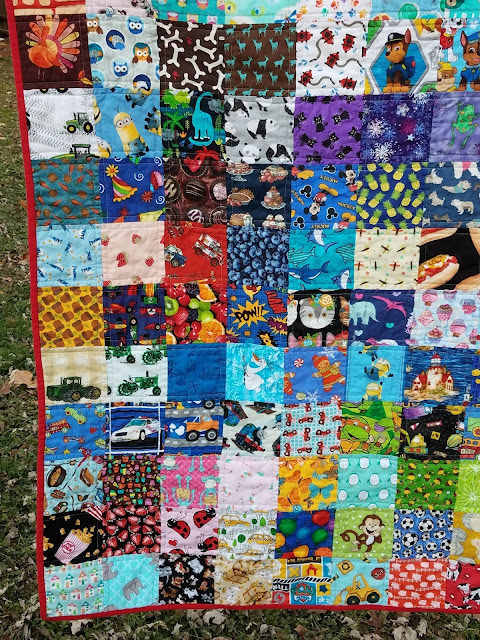 This quilt for Fire Monkey was the only one not yet completed. I made it with a week to spare! I'm so glad that Fire Monkey enjoys sewing with me! I hope he continues to ask to do it and that we make many more quits together. Most fun traffic jam I've ever seen! 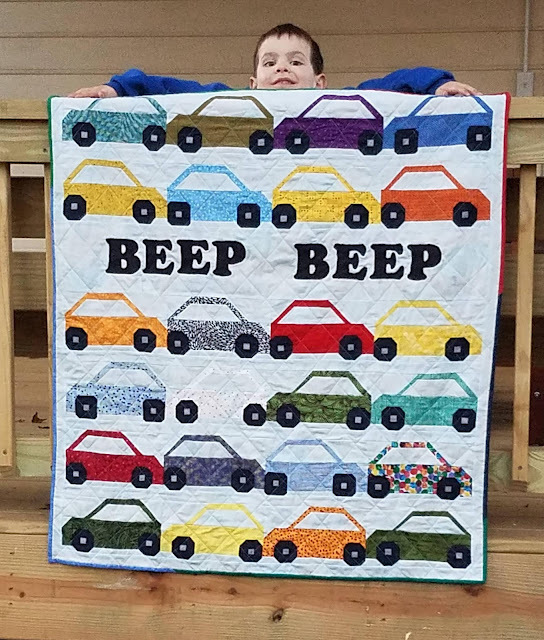 The pattern is Bumper2Bumper by Lorna of Sew Fresh Quilts. 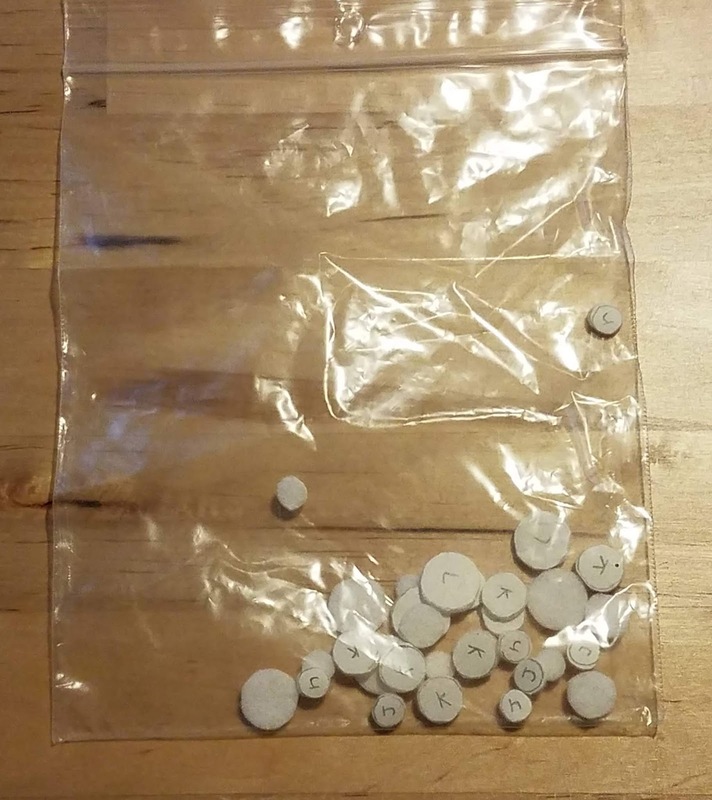 There are two different block sizes; this is the smaller. The pattern calls for 7 rows of cars but I left out one row to add in the "beep beep!" I used my Accuquilt alphabet die for the letters, but note that Lorna also has a pattern for traditionally pieced alphabet letters. 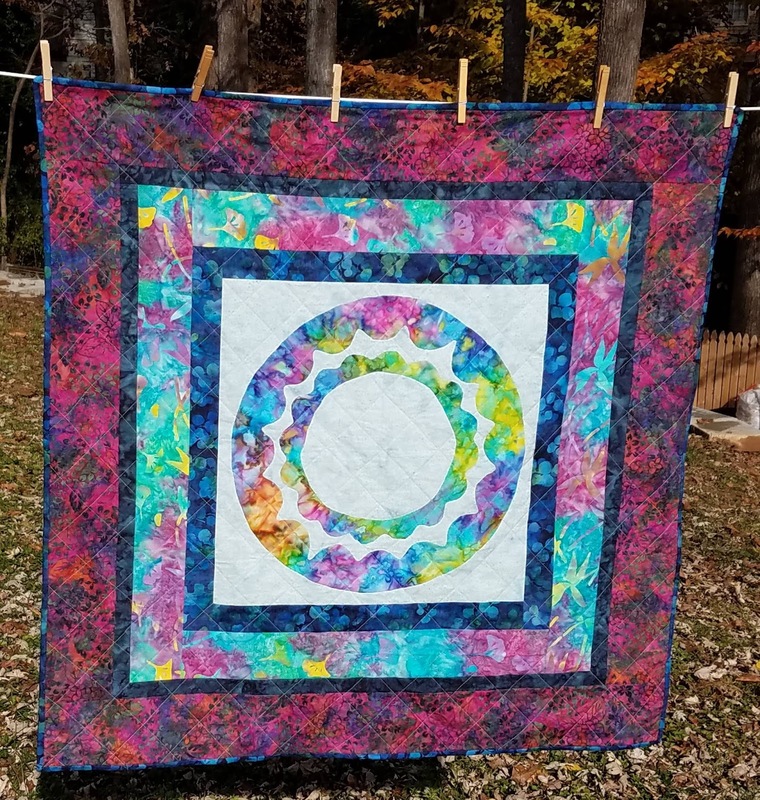 This was my Rainbow Scrap Challenge block/project for 2018. 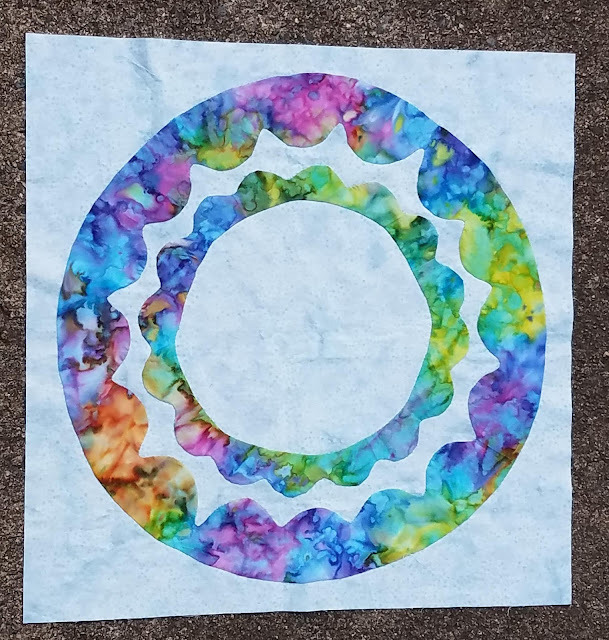 Rainbow Scrap Challenge is hosted by Anglea of So Scrappy and is one of my favorite annual challenges. You pick whatever project/block you want to make. Every month, there is a featured color and you make however many blocks you want (or even a whole quilt!) in that color. 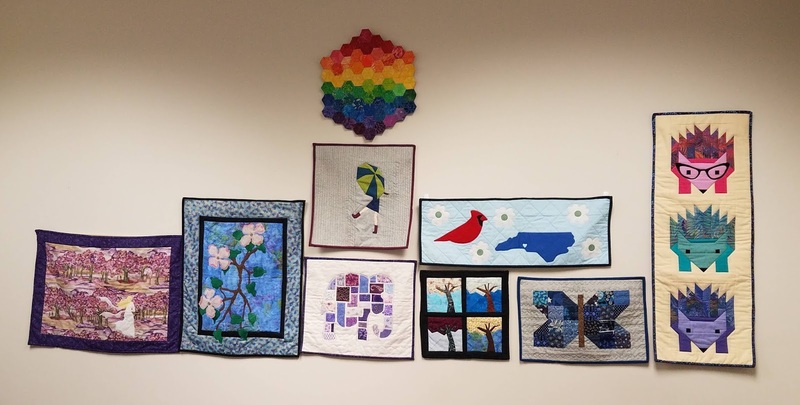 The idea is that at the end of the year, you have a quilt's worth of blocks in rainbow colors. It's super casual and there are no real deadlines, just lots of fun and encouragement. This is my third year participating. 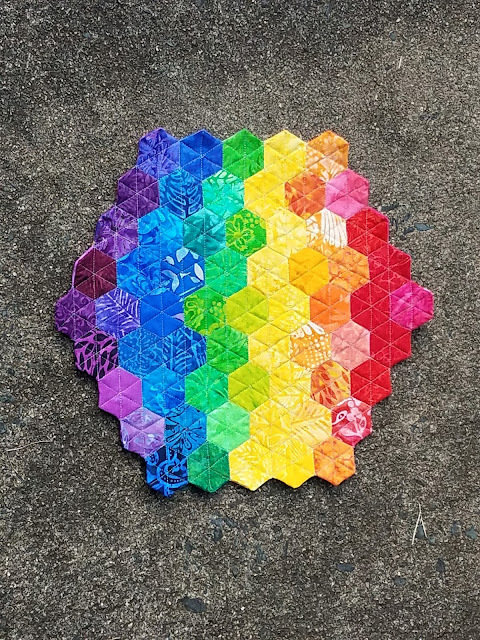 For the first time, I didn't put my blocks in rainbow order but mixed them up, and for this pattern I think that worked better. 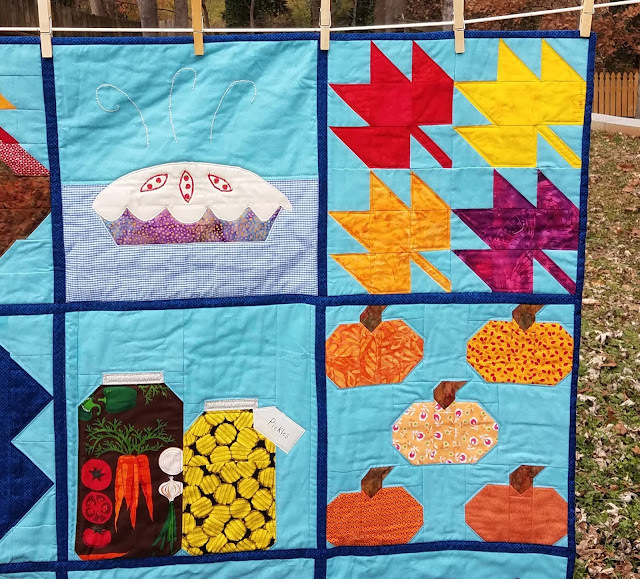 This is my second year using one of Lorna's patterns for RSC and I will use one of hers next year, too! The background is Kona Sky, the wheels are Kona Indigo and the lug nuts are Kona Medium Gray. The cars themselves are scraps. Since it's a scrappy quilt I used a scrappy binding, picking out solid colors that has good contrast to the sky. I am pleased to have used up 5 different leftover bindings! I found the most perfect fleece backing in my closet. 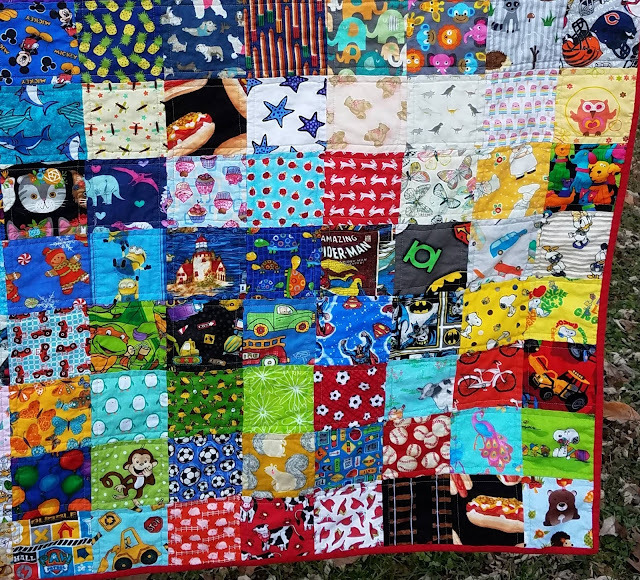 I love to back my quilts, especially my donation quilts, with fleece. I do not use bating, just the top and the fleece. 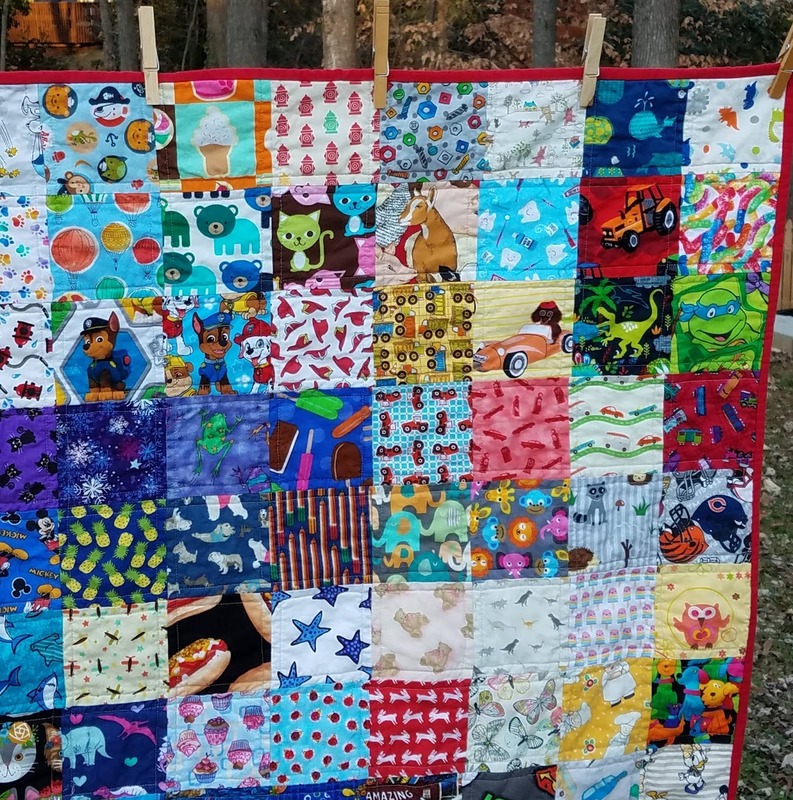 It's soft, it makes a great weight quilt, and honestly it's cheaper than buying batting for all the donation quilts I make. 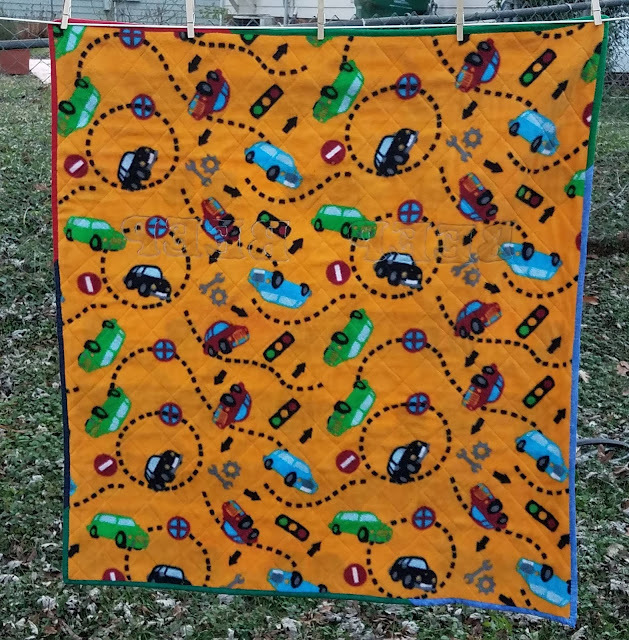 I've been told that the kids really like the soft fabric and that makes sense; my son does, too! This one I'm pretty sure came from my friend Snow who gave me several larger cuts of fleece she wasn't going to use. The problem is, with the really light background fabric, you can occasionally see parts of the darker cars showing through on the front. It's not really noticeable and I decided that the perfect (and fun!) backing mattered more than an occasional glimpse in *just* the right light, so I used it anyway. And I'm glad I did! 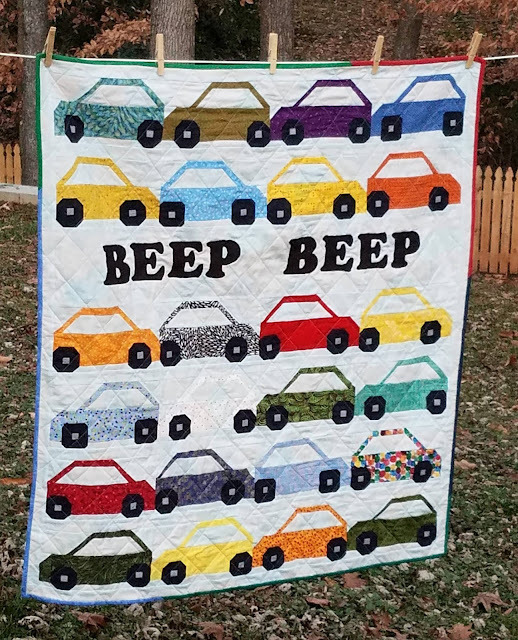 This will be going to my local Project Linus chapter and imagine having fun cars on BOTH sides of your quilt! Bumper2Bumper was #15 on my list of Q4 goals for the globally-hosted Finish Along. 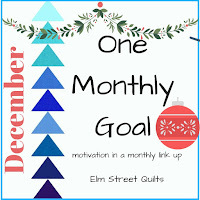 It was also my One Monthly Goal (OMG) for the monthly goal-setting link-up hosted by Patty of Elm Street Quilts (goal setter #70). And since I've been working on it for all of 2018, it was a UFO that is now finished, so I'll link up with Tish for her next UFO busting party. 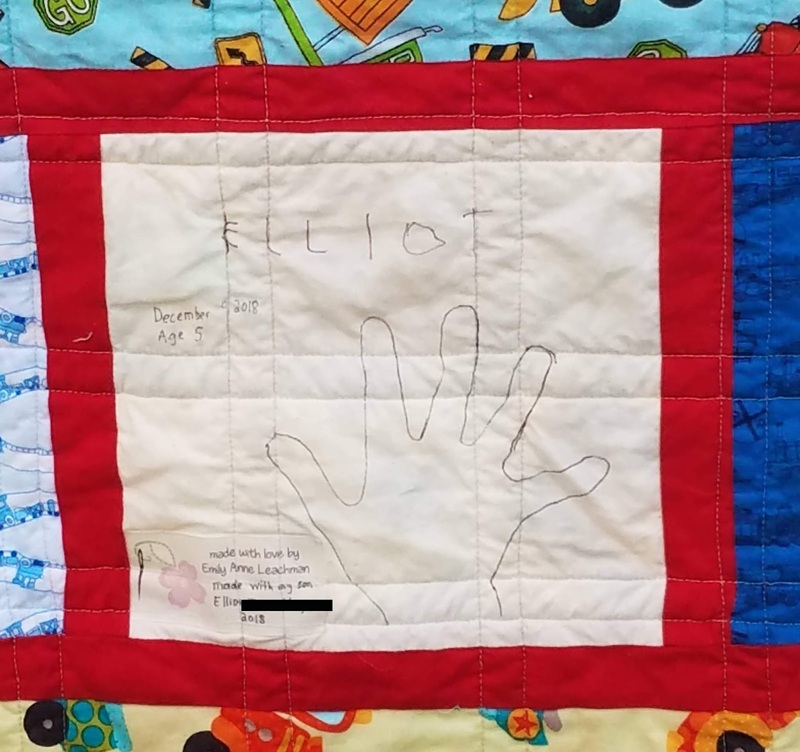 Last year, I participated in a Christmas Quilt Along designed by a group that now calls themselves Partners In Design. I really enjoyed it and was excited when they announced that their 2018 QAL had a fall theme. Every two weeks, a different block was released. 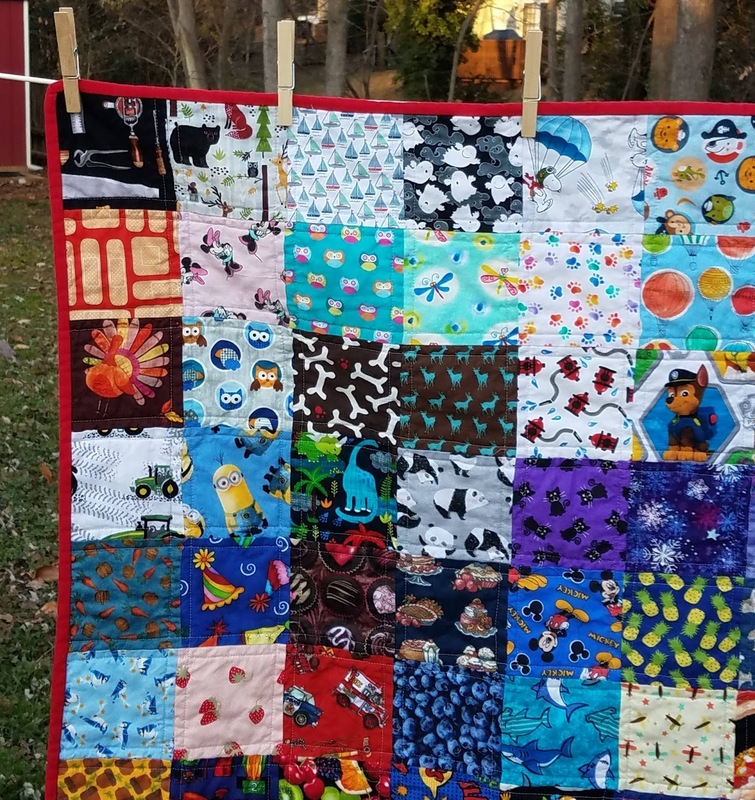 Here's my completed quilt! For the Christmas sampler, I was 100% scrappy from stash. I liked it, but missed the cohesion that I saw in some of the other quilts. So for this one, I chose a background fabric, Kona Waterfall, and everything else was from stash. So it's scrappy but looks like it all belongs together. That turkey was the hardest block! It's cute, but man was it tricky. So many pieces! The QAL had twelve blocks. I planned on a 4 x 4 setting, so I needed four additional blocks. The acorn block gave two options and I made them both, leaving me with three blocks needed. Since colorful leaves are such a big part of fall, I decided to make different leaf blocks and put them in each of the corners, with the leaf designed for this QAL in the fourth corner. 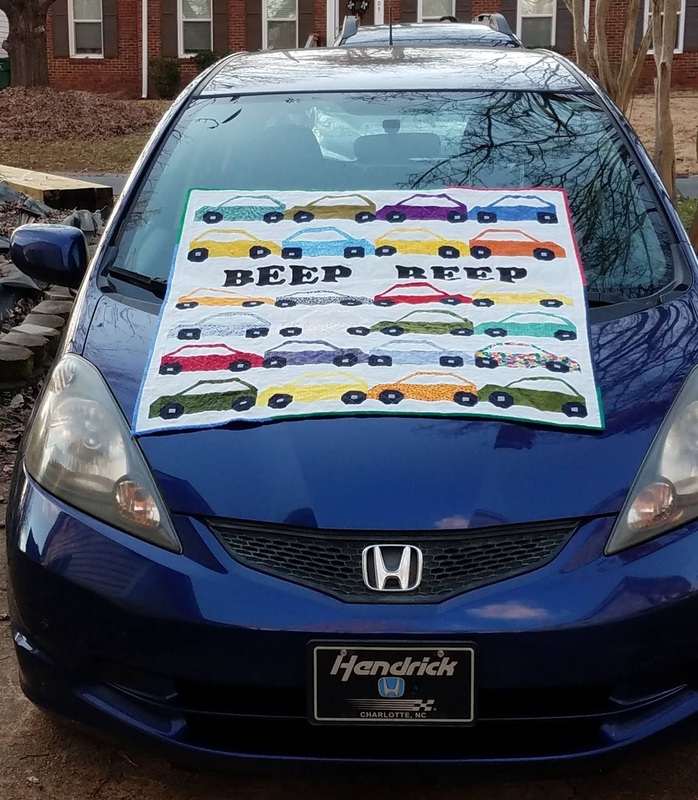 I did this as a Quilt-As-You-Go project. 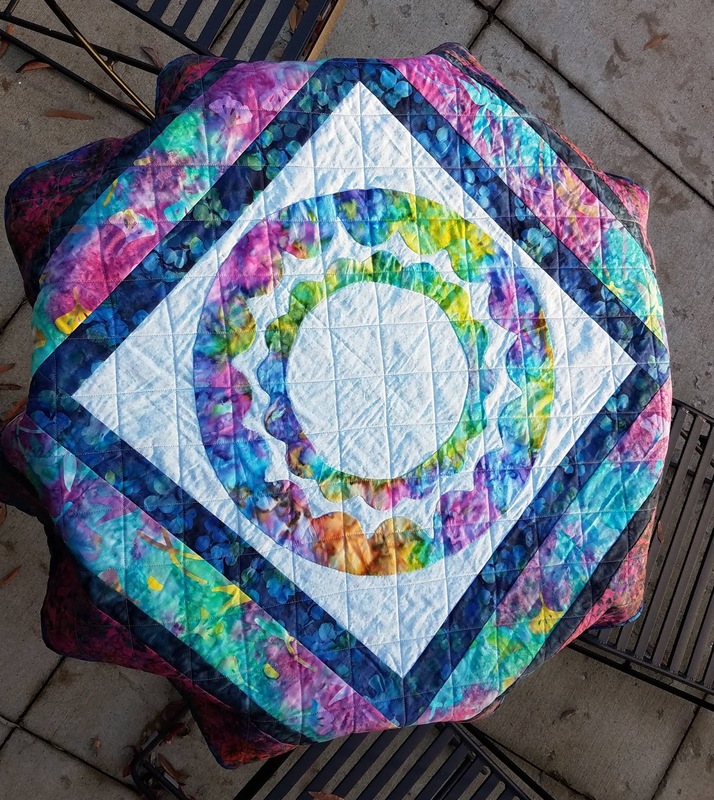 My favorite quilting is that sunflower with the big spiral. 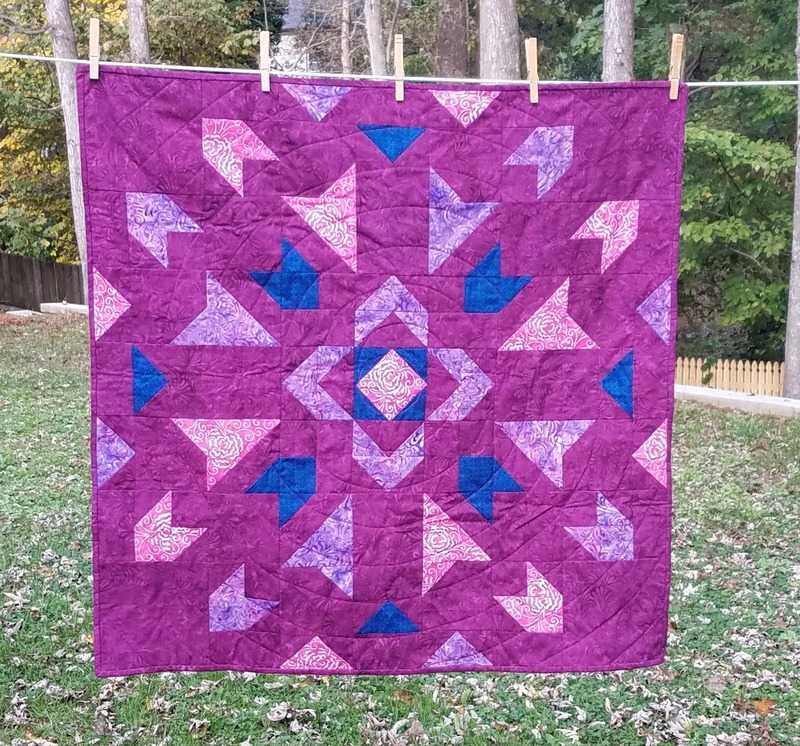 This is my third quilt using this version of QAYG and I'm starting to fall out of love with it. I love doing the quilting in small sections, but I struggle with the assembly. I'm going to try a different technique for QAYG and see if I like it better. 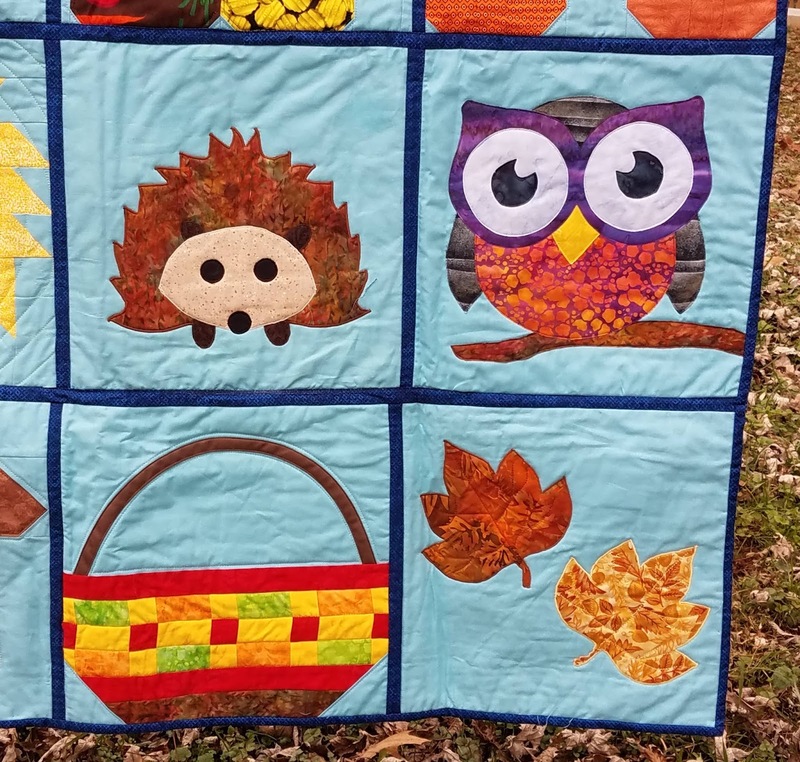 I think the owl and the hedgehog are my favorites! When I say that everything but the background is from stash, I mean everything, including batting and backing. 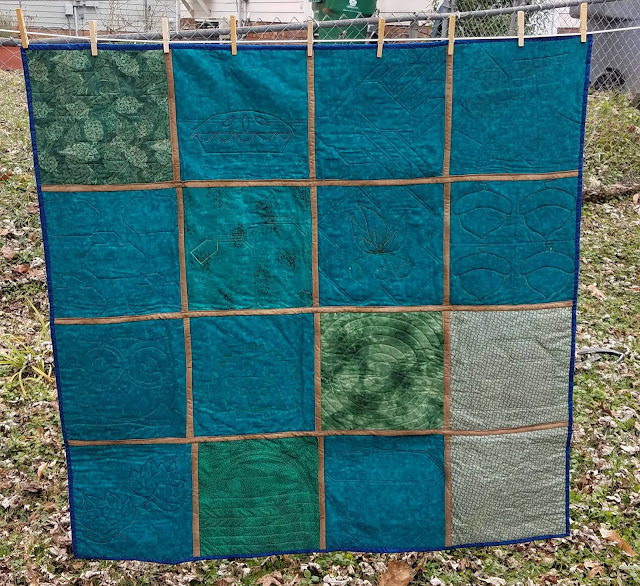 I had a dark teal mottled fabric that I used for most of the blocks, but there wasn't enough for 16 blocks. So whatever I had in shades of green that was big enough was used for the other blocks. It's a bit eclectic. 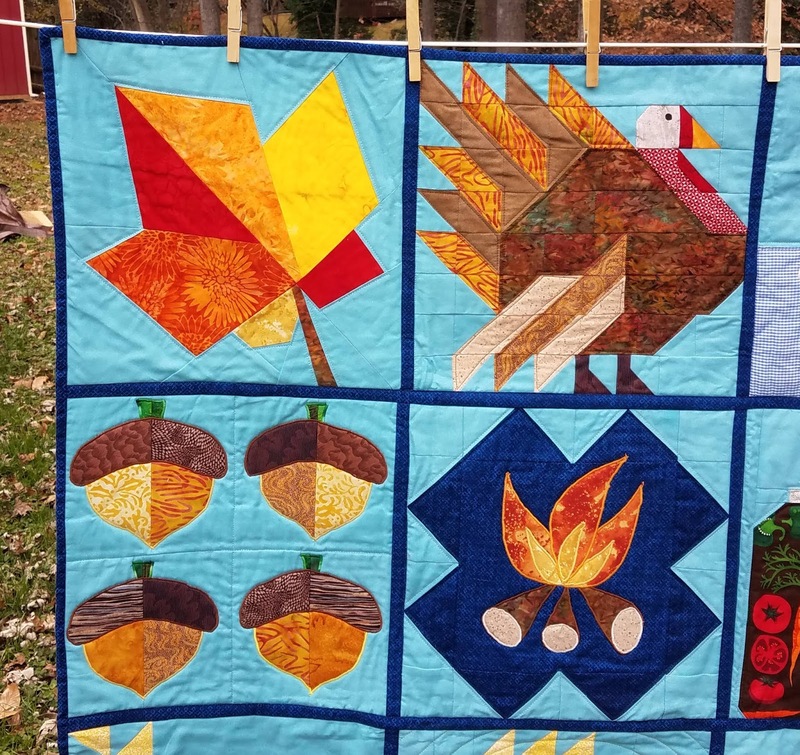 The same group is planning another quilt along in 2019. They asked for theme ideas and I suggested "day at the zoo." It will be fun to see what they pick! 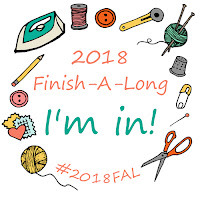 Fall QAL was #18 on my list of Q4 goals for the globally-hosted Finish Along. 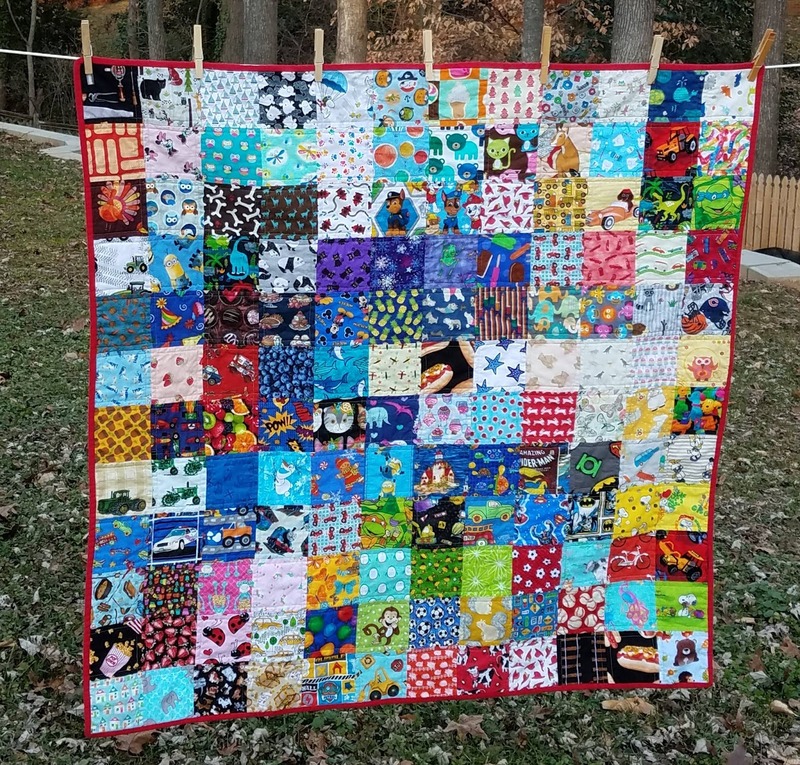 It has been donated to my local Project Linus chapter. 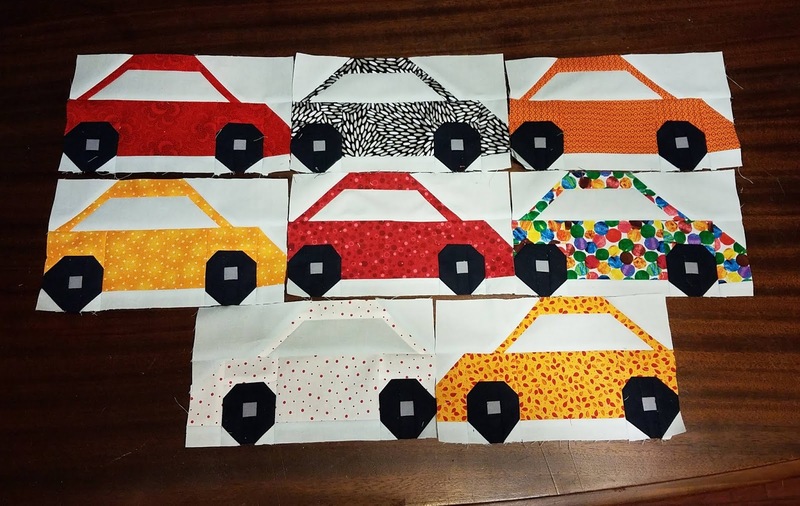 In November, I set my One Monthly Goal (OMG) as completing my last 8 car blocks for the Rainbow Scrap Challenge. I did complete those 8 blocks. On December 3rd. Better late than never, right? Aren't the cars the cutest? The pattern is Bumper2Bumper by Lorna of Sew Fresh Quilts. 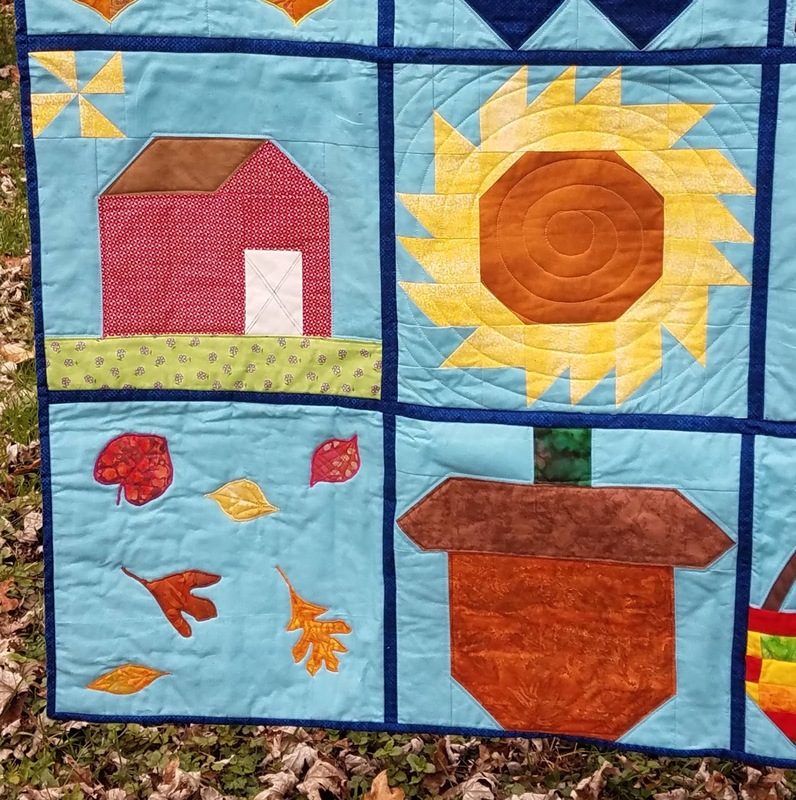 For my December goal, I'm going to be optimistic and set completing this quilt. 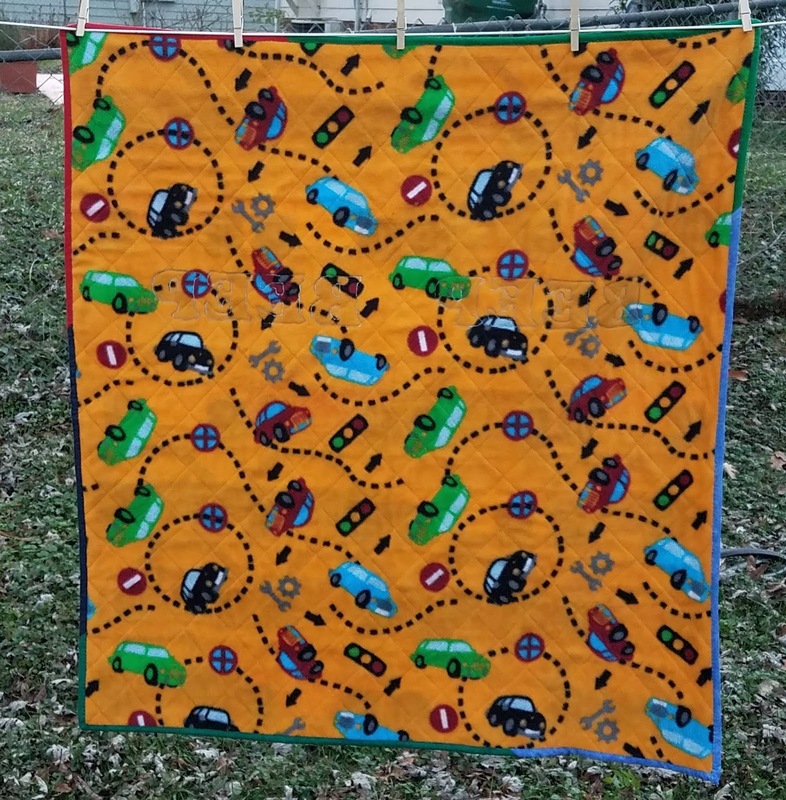 Linking up with Patty of Elm Street Quilts for the One Monthly Goal. November was Queen Becky's turn in Stash Bee. She asked for kaleidoscope blocks. I think this was my first bee block that used a paper template. I was not a fan of cutting using that template and am glad I only had to make 2 blocks that way! I hope Becky likes her blocks! Bee Inspired scheduled everything so that the last Queen was in October, so this marks the end of the year for me in terms of Bee blocks. Bee Inspired is changing how they do things for next year, so there is no "bee" in that we will not be making blocks for each other. I believe I am slotted to continue in Stash Bee, though. 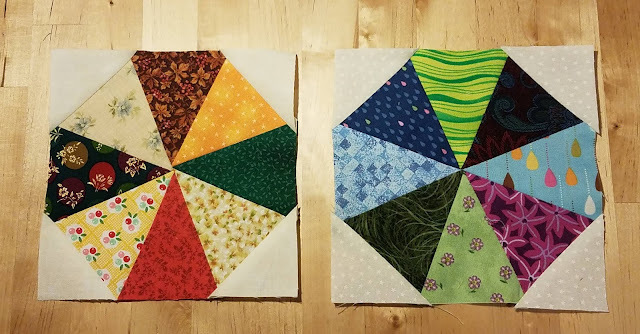 It's fun to try all kinds of blocks in different color schemes without the commitment of an entire quilt. I also really enjoy the social aspect of bees and knowing that blocks I made end up in quilts all around the country and the world. Last spring and summer, I participated in the Rin Along hosted by Cheryl of Meadow Mist Designs and Cindy of Hyacinth Quilt Designs. They were doing the pattern Rin by Carolyn Friedlander. Rin is a needle-turn applique pattern, and needle turn applique has been on my quilty bucket list for a while. I decided to sew along and make one block. I finished my block in time to be part of the parade last July. Then the block sat unfinished. I'm pleased to say it is unfinished no more! I used a beautiful rainbow batik fat quarter for the rings. The light blue background is the only fabric I bought for this project. Once the block was done, I used batik scraps to make it bigger. The first border and binding are left from a yard I bought at QuiltCon last year to use as binding for my Meadow Mystery quilt. The teal and pink 2nd border is an Island Batik print that I won from Laura of Slice of Pi quilts. She had a giveaway for scraps from her beautiful scrappy lone star and I was the lucky winner! The colors of this fabric go so well with my ring fabric, you'd think I bought them together! The last two borders are leftovers from a quilt I made my college friend Jen years ago. I remember buying the outer fabric (it has such awesome colors!) at a shop when I was living in Michigan for graduate school. Scraps live forever! I used crosshatch quilting. 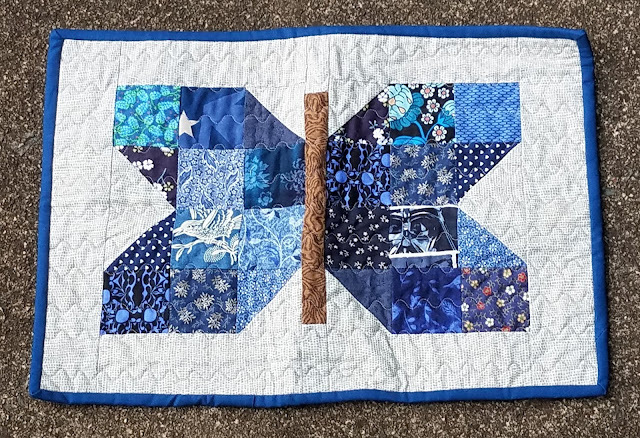 I'm super pleased with how it turned out, and bonus for crossing an item off my quilting bucket list! 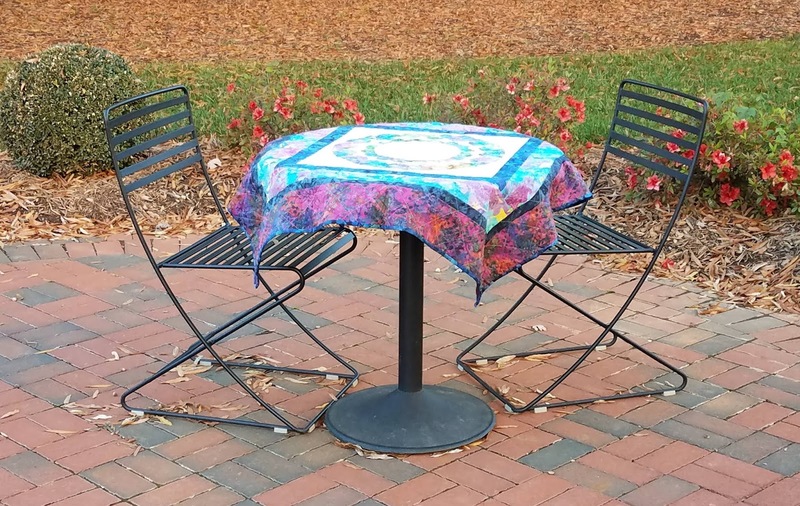 This will be donated to the Charlotte chapter of Project Linus. Rin was #1 on my list of Q4 goals for the globally-hosted Finish Along. It was also on my list of UFOs to finish to earn my PhD (Projects Half Done) with Quilting Gail. I have a large blank wall in my office at work. I've slowly been adding mini quilts to it, and my goal has always been to fill up the entire wall. Well, we're moving to a new building as soon as the semester ends so I will never get to fill up this particular wall. I've already taken them down, but I did take a picture so I can remember them all together. Don't they just look so great all together?? There is something magical about a wall of mini quilts. I'm not sure that I'll have such a great blank wall in my new location, so what happens to this collection remains to be seen at the moment. And I have a few almost finishes to add to this group, once they have a new wall to call home.